With US Non-Farm Payrolls coming in at a solid +175k, gold and silver prices are set to take another leg lower as a complete absence of additional quantitative easing removes the need to buy gold as a hedge against further easing of US monetary policy. We therefore see both gold and silver prices taking another large leg lower in coming months, with both precious metals hitting new multi-year lows before too long. The mechanics at play here are not overly complex, with employment data being the most significant driver of gold prices in recent years due to Fed’s focus on battling the high employment rate with aggressive easing of monetary policy and additional quantitative easing. The Fed is mostly focused on the three month average gain for payrolls, and so long as this number is above 150k, there is no chance of additional quantitative easing. Many of the bullish arguments for gold are no longer applicable in the current market environment; therefore they should be dismissed in the investment decision making process. Here are five of the most popular, and our reasons for ignoring them. 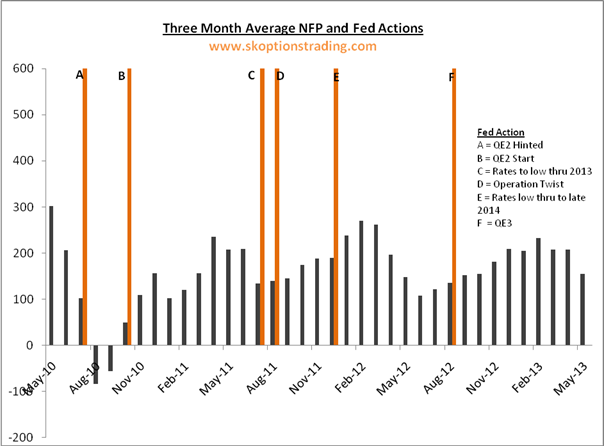 All that matters here that that Fed thinks this data is accurate; therefore they will base their actions on this data. Since the Fed, and only the Fed, decides US monetary policy, it is their actions that we pay attention too, since their actions are what move markets. Gold prices have fallen $500, how many mines have shut down production and cut supply as a result? The supply coming from investors exiting position will dwarf any possible reduction in gold mine production. Plus reductions in mine supply takes years to flow through, therefore it is barely worth considering when looking at the next six months. If anything, all this statement shows, if true, is that the mining stocks are very vulnerable to further falls in the gold prices and many companies may not be viable if prices fall much lower. The fact that the Fed is still doing its 80bln a month as part of the QE3 announced in September is irrelevant, gold has fallen from $1800 to $1400 whilst this easing was being implemented. The gold market had this easing priced in as soon as it was announced and therefore requires more easing, new easing, to push prices higher. Maybe the physical gold price in reality is higher than the gold futures price, but it’s not $500 higher, it’s not even $100 higher and frankly we would be surprised if it were more than 5% higher than spot gold. Our point is that the gold price is much lower across the board, and arguments like the above are merely an attempt by frustrated bulls to distract attention from that fact. If anyone is still prepared to pay $1800 for gold bullion, please contact us and we will be happy to supply as much as you want there. Just because something is low does not mean it cannot go lower, just as if something is high that does not mean it cannot go higher. Markets do not always revert back to previous levels, and if they do why wouldn’t gold be just as likely to go to $1000, $850 or $500 as $2000? All of the above argument could have been made, and were made by many bulls, when gold was $400 higher. We therefore ignore such arguments as broken records that add no value in the process of determining ones view on market direction. Whilst gold made a valiant effort to hold the key support at $1350, it has failed to make a higher high and has really struggled with the $1420 resistance level. In our view it is now a question of when, not if, gold prices break below $1350, and most likely this will happen very soon. After $1350 we would see $1260 as the next support level, which again will only provide a pause for breathe should we still be without addition QE. 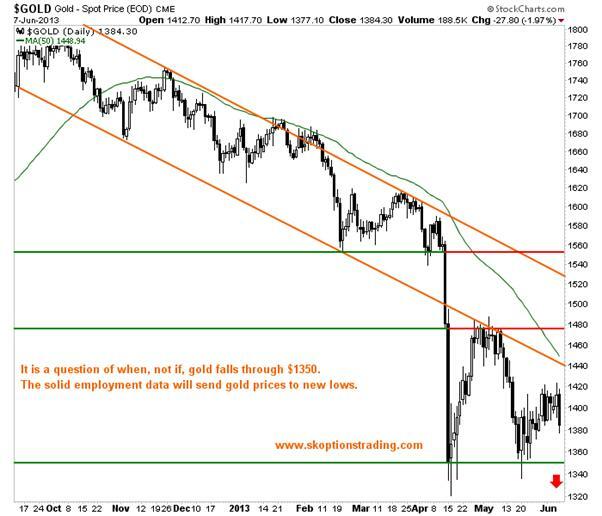 Gold prices will reach $1200 by year end in our view, a 13% drop from here. We think the most likely form of the decline is a slow grind lower, since much of the fast money and leveraged long positions would have been flushed out during gold’s record breaking drop in April. Gold prices have been more volatile recently than they have historically, as the chart below shows, therefore we would expect the volatility to ease and gold to drift south at a more moderate pace. Silver has broken a crucial support level at $22 and now will move swiftly down to $20 before heading into the teens later in the year. The $22 level for silver was similar in importance as $1350 is for gold now. Silver remains very vulnerable to a large drop, given how much more volatile it is than gold, and historically it has exhibited a greater tendency for larger, sharper, more dramatic moves down. 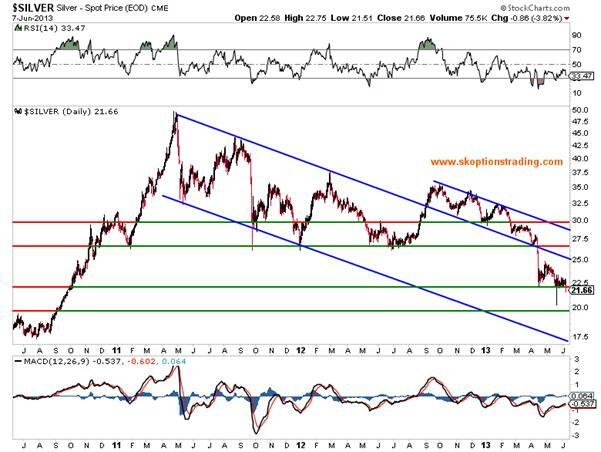 Silver will struggle to form any kind of rally from here with gold prices falling. We have been bearish on gold and silver since the start of 2013, and therefore have been trading from the short side for most of this year. Previously we had concentrated much of a short exposure in the gold and silver mining stocks, since we held the view that they would fall further than the metal itself, which was correct and we banked profits of 212%, 175% and 135% using put options on gold and silver mining stocks. However, whilst we still think there are some miners that remain very vulnerable, the risk-reward dynamics in being short the mining sector in general are not as favourable as they have been in the past. So, whilst this strategy has worked well for us over the past few months (our model portfolio is up 45% so far in 2013 as of Friday’s close), we are taking a different approach for this next leg down. We have short exposure through a variety of trades at present (details available to subscribers), and will look to add on any rally, building an aggressive short position. 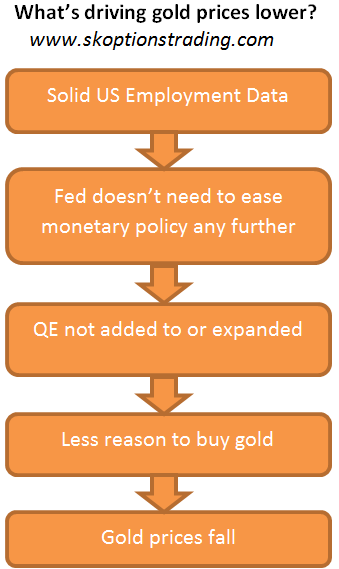 The forces at work in the gold market are as simple as the flow chart featured at the start of this article. US employment data has been solid, the Fed believes that the employment situation is improving; therefore Bernanke will not be embarking on any additional QE programs in the foreseeable future. The energy behind gold’s bull market has gone. Therefore gold prices are heading lower until further notice. Perhaps a collapse in employment somewhere down the road may put more QE back on the table, and gold could shine again one day. But at present that day is a long way off and gold prices will head much lower before they go higher.